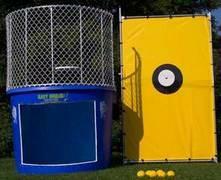 Dunk tanks are an essential party item for every school carnival, company picnic, or birthday party. You can dunk your principal, boss, parents, and kids too in this classic dunking game! Hit the target and dunk the victim in the dunk tank! Just need a dunk tank? Call our office to arrange a pickup at our warehouse in Fox Lake, IL and save a few $$$.